I'm attempting to build a giant scarecrow to add something new to this year's festival. I've started with the face, because if that does not work, the project is doomed. Here's stage one. 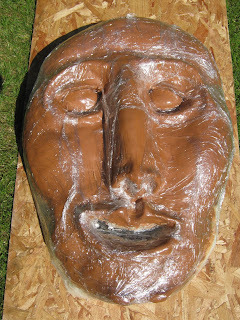 The head, modelled in clay over a plastic and paper base, is nearly two feet high. It is covered in cling film, ready to add the first layer of papier mache.